With the month of May well underway, Commencement is just around the corner on Monday, June 14! We have a great deal of information to share with the Peirce College community surrounding the upcoming events, so I’d like to take this chance to provide some highlights and things to watch for in the coming weeks. Soundtrack to Commencement: Peirce students and graduates have selected a new closing song for Commencement 2010. The end of the ceremonies will now be marked by “I Believe I Can Fly,” by R. Kelly. Peirce Idol: Another feature introduced this year was the audition process to select the student who will lead us in the singing of our national anthem at this year’s Commencement. We had five great contestants come out and share their talents, so check out the auditions and vote for your favorite! The winner will be announced soon. Speakers: Back in February, we shared the great news that Mayor Michael Nutter will deliver the keynote address, but we had yet to reveal who our student speaker will be -- the wait is over! We are proud to announce that Holly Frey, who will graduate in June 2010 with her Bachelor of Science in Paralegal Studies, will be sharing her insight and experience as the 2010 student speaker. Show Your Peirce Pride: We will have a variety of Peirce merchandise for sale at all of the events surrounding Commencement. 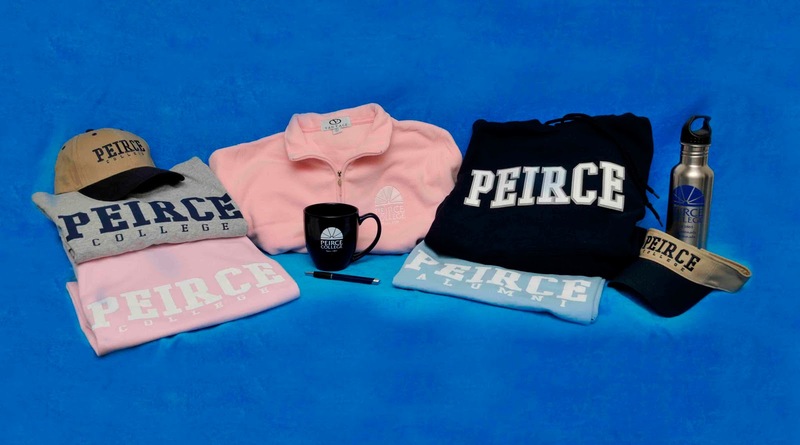 Keep an eye out for the displays featuring sweatshirts, T-shirts, mugs, pens, and plenty of other Peirce items that you’ll be able to purchase right on campus. Caps and Gowns: Caps and gowns are on sale now through May 17. The graduating class can purchase them either through the Peirce College Web portal under the My Info tab, or in the Business Office, located on the lower level of College Hall. Business Office hours are Monday through Thursday, 9 a.m. to 6 p.m., and Friday, 8:30 a.m. to 5 p.m. Special hours will be added on Saturday, May 1 from 10 a.m. to 2 p.m. If you decide to order online, please designate if you will need your cap and gown shipped to your address. The cost for cap, gown, tassel, and hood is $40. Students may use their own cap and gown as long as it is black, and purchase a hood and tassel for only ($23). Remember, the deadline is May 17! Any questions can be directed to Jeri Dmyterko at 888.GO.PEIRCE, ext. 9120, or JDmyterko@Peirce.edu. Graduation Portraits: Herff Jones is providing services for any graduate wishing to purchase graduation portraits. Students can go to www.ouryear.com to find out about services and to schedule an appointment. When scheduling an appointment, please enter school code: 87148 and year: 10. The remaining date is June 14 from noon to 4 p.m. All photography sessions will take place in College Hall, room 65. Announcements, Frames, and Rings: Graduates can also visit Herff Jones' website to obtain information about ordering graduation announcements, diploma frames, and college rings. Herff Jones will be on campus June 14 from 1 p.m. to 4 p.m. in the main lobby of College Hall. There will be a limited number of frames on sale in the Business Office until May 17, 2010. Toss Your Caps! Philly Graduates from College: On May 14, Mayor Nutter is hosting a citywide graduation celebration to honor Philadelphians who have earned their college degree. Five hundred graduates from approximately 20 colleges and universities are expected to participate. The event will include remarks from special guest Bill Cosby! Peirce is proud to be sending nearly 30 representatives from the class of 2010. Open House and Receptions: On Monday, June 14, students and guests will have the opportunity to participate in a tour of Peirce College. Tours will begin every 30 minutes in the main lobby of College Hall and run between 1 p.m. and 4 p.m. Anniversary Attendees: Immediately preceding Commencement at 5 p.m., Peirce will also celebrate alumni from the Classes of 1930, 1940, 1950, 1960, 1970, 1980, 1990, and 2000 at a special reception held on campus. To attend, please contact Julie Jurash by May 22 at JJurash@Peirce.edu.